Thus you don’t get a „rigid“ Gantt application every modification has to be ordered for specifically, but a Gantt „framework“ , especially designed for you. Like a control, this Gantt framework can be accessed by various properties and be equipped with individual data, labels, colors etc. according to your wishes. And the good thing is: you can always select which of your options shall „come into action“. If, for instance, your specification includes the option of showing labels within, beneath, and above the bar you can nevertheless decide that, for starters, texts are only displayed within the bar. So what this means is that we are anxious to provide you with a hands-on planning board that can be quickly integrated while at the same time offers you the necessary freedom of design for your own individual controls that you have specified with us. Different views (of orders, resource allocations, capacity load), linking of orders, dragging tools, flexible timescale and much more help the user to plan, manage and control orders and resources. Watch and test the planning board live. The Gantt widget we develop for you is tailored towards the specific visualization requirements of your business logic. By accessing your objects by API you can modify the settings as you like. That way, you gain an integrated planning board and at the same time design of freedom for your own visualization. - -You gain “time-to-market” or “time-to-value”, respectively. - You benefit from our decades of experience in designing user-friendly visual planning board. 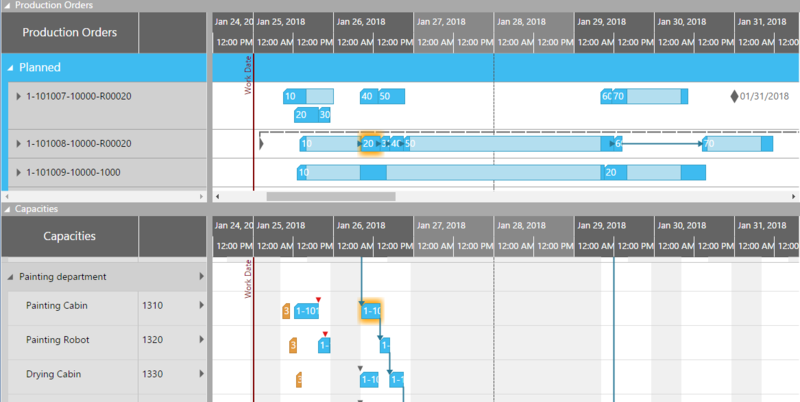 Our customers normally use a dynamic timescale that automatically (by mouse-wheel interaction) adjusts to the selected solution, so that the planner can zoom in and out seamlessly. The timescale changes in both directions: from years to months, to weeks, to days, to hours, to minutes, and to seconds. The timescale even allows to scroll left and right. The benefit of a histogram is obvious: Capacity conflicts at a resource or resource group immediately become apparent. Up to now, histograms were usually shown below the diagram. However, some of our customers want to show histograms within a diagram row, thus shaping the link between allocation and availability more directly. More ideas about how to visualize capacity loads you will find in this blog post. 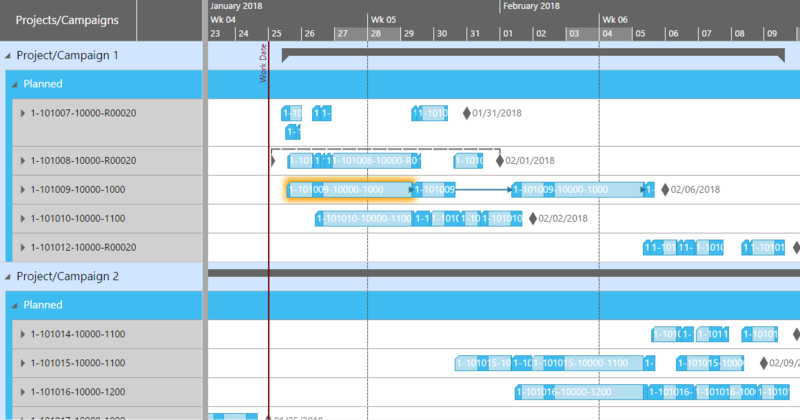 Showing links between a project’s tasks is standard of a Gantt chart but our customers sometimes also have to link projects among each other or combine them to campaigns. Some applications require to display more than one Gantt chart. 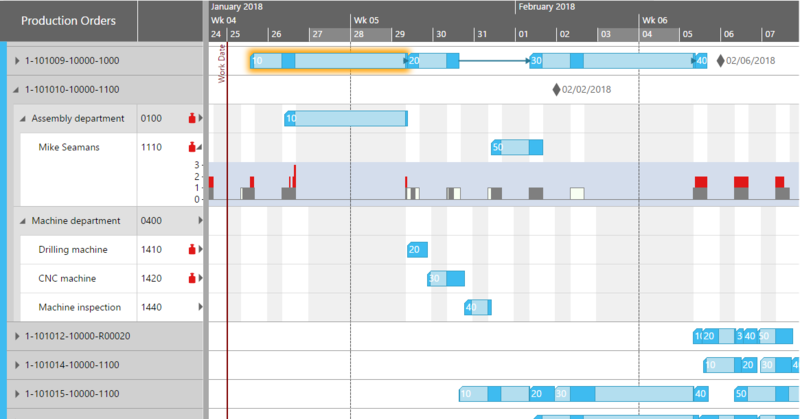 Many customers would like to stack Gantt charts and, e.g., visualize not-yet allocated orders in the upper Gantt and the actual plan in the lower chart. Or they select other forms of visualizing the order backlog as described in this blogpost. Three steps will lead you to a faster market-readiness of your product combined with a better planning experience for your customers. We have shaped the cooperation according to a certain schedule that is based on our experience and ensures obtaining convincing results. This is the most important step at the very beginning of a cooperation. We need to understand the business that your application serves, and which data are scheduling revelant in terms of "needed for interactions" and which are needed for information purposes only. Typically, there is no "one size fits it all" approach and a Gantt chart no longer is just a Gantt chart. We recommend to think about different views on the same data. Such as a job oriented view, a resource oriented view, a capacity orientied view etc. Of course, each view will support individual scheduling aspects/tasks within your application. Based on this, we will jointly define "your" API of your customized widget for just your specific scheduling tasks. Usually we will come up with a proposal for the API that will embrace the structure of all required data, the methods, and the events. Nothing more to say. You will see how your customers will love the interactive HTML5 planning board. Feel free to reach out with any question you have. We are happy to help.